The Norwegian dog breeds are known to be good working dogs. They have served for generations as farm, herding, and hunting dogs and are universally appreciated as great companions and family dogs. Dunker, Haldenstøver, Hygenhund, Lundehund and Norwegian buhund are all on the list of endangered breeds. 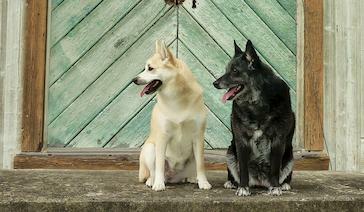 Norwegian Elkhound gray are also recognized as worthy of preservation, but are not threatened. The Norwegian Hound, known in Norway as a Dunker, is a medium-sized working scenthound. The breed was created in the first half of the 18th century by Captain Wilhelm Conrad Dunker (1806-1860). .The breed club ("Specialklub for Norske Harehunde") was founded in 1902. He wanted a good dog to hunt rabbit with, using scent instead of sight. By crossing various breeds, he created a powerfully built, well balanced, versatile dog. The Dunker is a clear rectangular dog that is powerful and strong, but not too heavy. The head should have good length, the skull should be slightly rounded with pronounced occiput and distinct, but not too deep or abrupt stop. The ears are medium high and hanging,tail is carried straight or slightly raised and curved. The harsh and dense coat can be tan with a black or marbled blue (dappled) saddle with pale fawn and white markings. Originally, most Norwegian hare hounds were black with brown and white markings. It works well and closely with its owner in the woods. The aim of the breeding program has always been to consolidate the best features of the old Norwegian hare dog, who was a hardy, robust dog with an excellent temperament. Today highlights hunters dunk's particularly strong paws. They can withstand ice and crust well so that a hunter can continue the search where other rabbit dogs have to quit. The Halden hound also called Halden støvare is both a good hunting dog and family dog as its name suggests, its origin is Halden a town in southeast Norway. There it was bred through crossings of Foxhound from England, beagle and local hounds in the last half of the 1800s. Breeding early made a distinct breed with a certain type of character that created the base for a race, but there were always problems with the narrow breeding base. The dog pest in 1931 and World War 2 was about to be the end for the Halden Hound, but enthusiasts did accelerate breeding again after the war. After Halden hound was recognized as a breed in 1952 the interest increased in the breed. But already in 1956 the interest declined, the breed has never been large and numerous. Halden hound is a good hunting dog with a good looking bright and friendly service. It is distinguished by having strong nerves and being very sociable and confident. Many Halden hounds have done well in the hunt tests. It has a good nature and is easy to train. Hygen hound is the result of breeding the family Hygen made ​​between the local hounds in Ringerike and Romerike from the first half of the 1800s and onwards. Hygen dog is named after the creator Hans Fredrik Hygen. From 1830 he lived in Ringerike and began breeding with local hounds. In 1839 Hygen moved to Romerike and took the dogs used in breeding here. The sons of Hygen continued their fathers work especially one of them, A.B. Hygen was very active. He participated in the creation of the Special Club for the Norwegian Hare hounds in 1902, and was also a central part of creation the new standard for the breed that came the same year. This year Hygen hounds and Dunker became defined as two separate breeds. Hygen dog is a clever rabbit hound and is very friendly. The Hygen hound is an endurance hunter who can traverse arctic terrain for long periods of time without fatigue.It is easy to train, it starts early to chase and it has a good hunting will. As a family dog Hygen is usually quiet and nice to have in the house. Norwegian puffin dog is an ancient breed of dog used for hunting seabirds in many parts of the Norwegian coast. We're not sure how old the breed is, but puffin hunting with dogs is mentioned in writings that are over 400 years old. The dog is very flexibility and is ideal for hunting the birds in their inaccessible nesting locations on cliffs and in caves. Interest for the breed declined when new methods for hunting puffins were invented and a dog tax was created. Lund dog's anatomical characteristics make it particularly interesting in conservation efforts. Especially for puffin dog is that they have six toes on all four legs. On the front paws, there are five three-articulated and a two-jointed toes. The extra toes have developed a good muscle machine, so they have a practical function. The outer ear may be folded together, so that the inner ear is protected against dirt when the dog is working in narrow caves. The dog has a amazing mobility. Their shoulder joint is designed so that the front legs can be laid flat out on the side, while neck joints flexibility allows the dog to tilt its head all the way to its back. 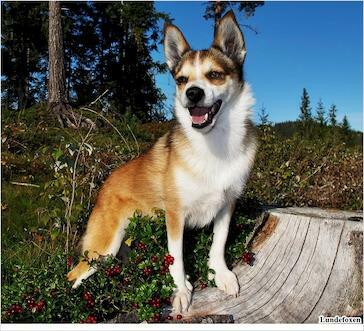 Norwegian buhund is considered to be a direct descendant of the dogs to the first settlers in this country.Norwegian Buhund is a medium sized dog with a cheerful and active personality. The breed was developed along the western coast of Norway and was originally used at farms for herding and guarding livestock. Buhund refers to ‘bu’ meaning homestead and livestock, and ‘hund’refers to dog. It was used for both cattle, sheep but even also reindeer and pigs. In many areas of Norway, there was a buhund on each farm. Often they held in the barn and they were sent with the livestock like goats grazing in the day. In the early 1900s, the breed decline mostly because foreign dogs were imported to Norway and outperformed Buhund. Systematic registration, controlled breeding and participation in the Norwegian Kennel Club's exhibitions led to the breed boomed and simultaneously formed the basis for the modern buhunden. The dog is also something to hunting. Because of its strong ability to learn has been gradually adopted it in other ways. By obedience and agility makes more and more for herself. The breed is also used as guide dogs and drug dogs in England. A Buhund is a nice and good family dog and are generally happy and faithful to all. Gray Norwegian elkhound has been a national flagship when it comes to the Norwegian dog breeds. To this day, this is the breed that appears in the logo of the Norwegian Kennel Club.Gray Norwegian elkhound have a tracked activity for many thousands of years, it’s an exceptionally versatile dog, a skilled hunter, especially moose and bear, and an excellent ability to cooperate. 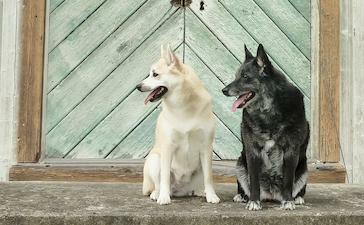 By 1905, Norway made ​​a standard for Gray Norwegian elkhound. Through the years since that time various details of the dog has been emphasized, and today we can say we have a pure race in extensive cooperation between Norway, Sweden and Finland for further breeding of the breed, both for the hunting and exterior side. Gray Norwegian elkhound gray is also a big breed in the United States. Gray Norwegian Elkhound has in recent years been a dog breed to become a natural part of the families, which is reflected in the temperament of today's dogs. It is a sociable dog, faithful to the family, very cooperative, which is good when the hunter takes it to the forest. 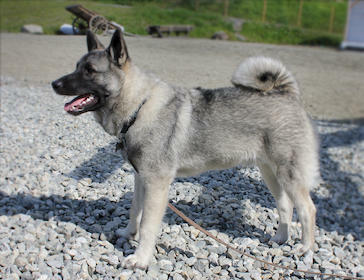 Gray Norwegian elkhound has a high status as a big dog. A sperm bank for all the Norwegian dog breed has beenestablished. Built up in a cooperation between the individual breed clubs, the Norwegian Kennel Club and the Norwegian Genetic Resource Centre. The goal is that the gene pool will contain sperm after ten dogs of each of the seven Norwegian dog breeds ( Dunker, Hygen hound Halden hound, Norwegian puffin dog, Buhund, Gray and Black Norwegian Elkhound). Seed should preferably be stored for ten years and can be used by, for example in acute crisis in a race or the need for "old" material in breeding. For more information about the preservation of Norwegian breeds, visit the website mentioned breeds of Norwegian Genetic Resource Centre. Foto: Bjørg Helgesen Sveen fra Kennel Cascilius. Cascilius har drevet et lite oppdrett av norsk buhund siden 1987. Photo:Elizabeth May Lernæs Selbekk, Lundefoxen kennel. A relatively new kennel (2008) located in Orkdal, Trondheim. Photo: Svein Helgesen Bjørg, kennel Cascilius. Cascilius is a small kennel established in 1987.